Joe T. Smith, Inc. has Kill Truck Services available for H-5 pressure tests with chart recorders, kill jobs, well circulation and a variety of miscellaneous Pump Truck jobs. The pump units can carry up to 130 bbl of fluid and are capable of 3000 psi. We also provide Vacuum Truck Services for pulling tank bottoms, loading and hauling drilling fluids, hauling produced water to our Disposal Wells located in Jones County and in Concho County Texas. Our tank trucks can fill frac tanks, service drilling rigs or haul water for well stimulation or other well site needs. We fill stock tanks with clean non potable water. 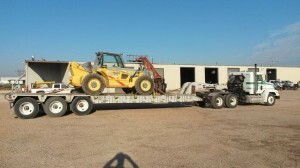 We have Lowboys available to move pipe, pits, mud pumps or other skid loads. We can move machinery that can be driven onto a DETACHABLE NECK lowboy. We also have Drop deck trailers. The trucks that pull the low boys have winches to facilitate material handling. We provide Clean, Non-Potable Water for the OILFIELD, FISH PONDS, STOCK TANKS or ANY OTHER NEED. Call for information. In addition to providing Kill Trucks, Vacuum Trucks, Frac Tanks and Swab Tanks we haul water; salt water, produced water and fresh water in Stonewall, Haskell, Throckmorton, Fisher, Jones, Shackleford, Nolan, Stephens, Taylor, Callahan, Coke, Eastland, Runnels, Coleman, Tom Green, McCulloch, Concho, Brown, Eastland, Schleicher, Menard, Mason, Kimble and Sutton counties in Texas. Joe T. Smith, Inc. rents Frac Tanks to oilfield operators for storage of fluids at the well site. The tanks have a capacity of up to 500 barrels and are used for storage of fresh water, salt water, flowback, oil storage for temporary production and mud. Frac tanks are used during all phases of the life of a producing well. 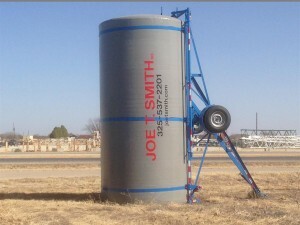 Joe T. Smith, Inc. now has Test Tanks to rent. These tanks are portable and can be used for temporary storage tanks or as swab tanks. They can be moved and set up on short notice and since they are made of Fiberglass they should withstand most produced fluids found in the oilfield. We can provide all of our services from either our Hawley yard in the Abilene area or from our Eden yard near San Angelo.